A 44-year-old female with a history of chronic tobacco use presented with non-ST segment elevation myocardial infarction (NSTEMI) and atrial fibrillation, complicated by ventricular fibrillation (VF) arrest. At coronary angiography, the first injection in the left coronary artery revealed normal coronary arteries [Figure 1]a and b. 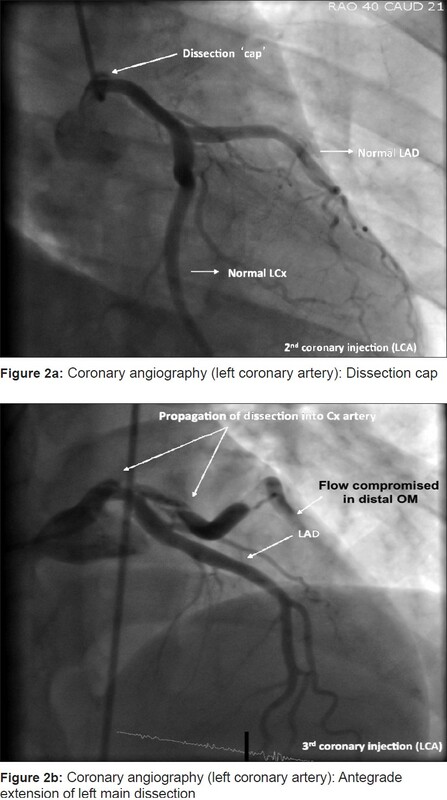 On the following injection, a coronary dissection cap appeared at the tip of the catheter [Figure 2]a, which extended antegradely on subsequent injections [Figure 2]b. She successfully underwent emergency aorto-coronary bypass graft surgery and was discharged 6 days later. Coronary artery dissection is a rare but potentially catastrophic complication of coronary angiography. 1. Boyle AJ, Chan M, Dib J, Resar J. Catheter-induced coronary artery dissection: Risk factors, prevention and management. J Invasive Cardiol 2006;18:500-3. 2. 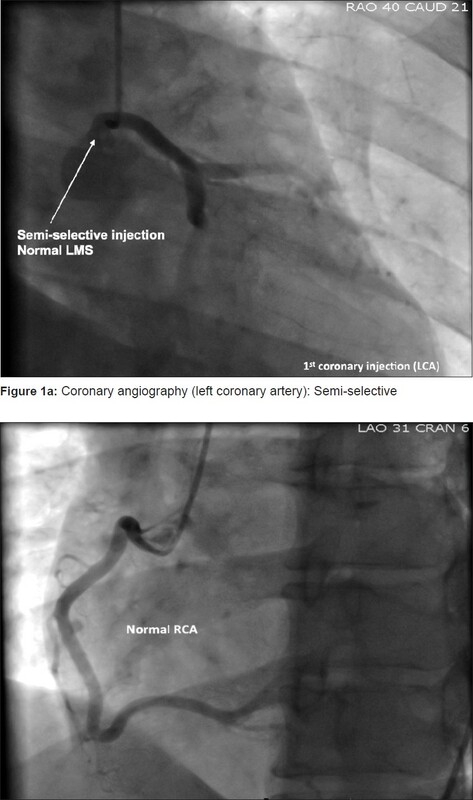 Awadalla H, Salloum JG, Smalling RW, Sdringola S. Catheter induced dissection of the left main coronary artery with and without extension to the aortic root: A report of two cases and a review of the literature. J Interv Cardiol 2004;17:253-7.